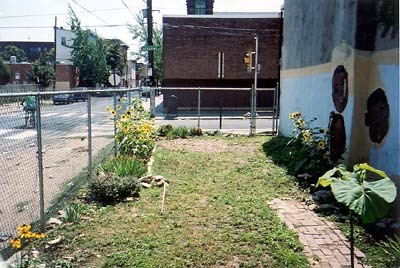 The sunflowers are now at the peak of their bloom, an encouraging sight even from across the street, even when the sidewalk is filled with trash. 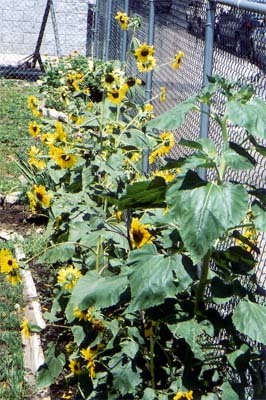 Another view of the sunflowers, with just a glimpse of the rudbeckia and other flowers in the background. 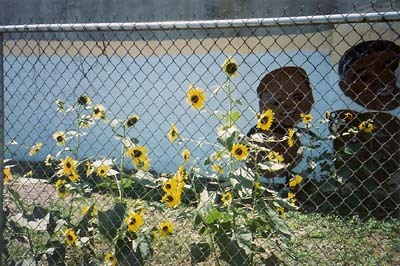 And another, through the fence, with the mural of the children's faces in the background. 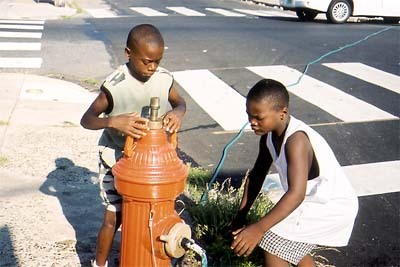 Kenyatta, right, and Anthony, both younger than eight, quickly mastered the technique of installing the adapter on the fire hydrant, attaching the hose and getting us all ready to water the garden across the street. 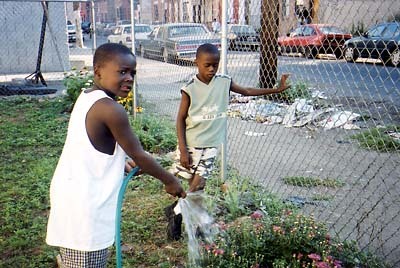 Here Kenyatta, left, waters one of the two original chrysanthemum plants (discovered and rescued when we cleaned the lot last year), while Anthony waits his turn. Life is more rugged just beyond the garden boundaries. This corner can be seen just beyond Kenyatta's head in the previous photo. 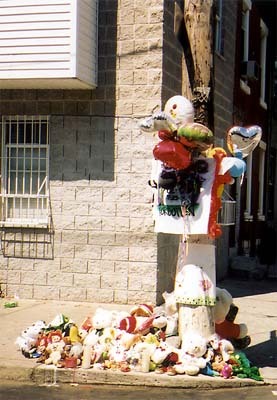 The display of stuffed animals and balloons is a memorial to Brevard Robert Holmes, a resident of the block, who was killed July 18 over a dice game. His funeral was held at Shiloh Baptist Church just across the street from us.